Thomas Mills Barn (c.1903-1909), Sarah’s Laundry (c.1911-1914), Stone’s Blacksmith Shop (1914-40), and Montgomery Barn (1940-2015). YESTERDAY: Thomas Mills’ barn; photo c. 1930. TODAY: Montgomery Barn is listed on the National Register of Historic Places; photo 2009. Andrew and Jane Ann Paddon Mills rented the Bingham Farm and log cabin at 317 West 2nd Street, Ogden, Utah, from the Patrick Shea family from 1894 to 1907. Andrew made improvements on the place and did general farming, raising sugar beets, potatoes, hay, grain, and milk cows. The Mills’ daughter, Jesse, married neighbor John Stone in 1899. Andrew died in 1902 before he could use some new lumber including some “stringers”, 2x6s, that he had purchased. Andrew’s son,Thomas (1883-1957), married Inga Emmertsen in 1905. About the same time Thomas built a new barn with his father’s lumber and “stringers”; neighbors Paul Christensen and Charles Price Sr. helped. In the Shea-Mills rental agreement of the old Bingham Farm, any repairs or improvements could come out of the rent. After Andrew’s death his sons, Thomas and Sam, made so many improvements, including a new barn, that the rent money was not sufficient for Mrs. Shea to pay the taxes, so she raised the rent. Widow Jane Ann Mills couldn’t afford to pay the high rent, and in 1907 they had to look for another place to live. Thomas and his wife rented a small house and a 20-acre farm across the road that he and his siblings farmed. Jane Ann and the unmarried children rented a house from Porter Pierce at 141 2nd Street; this house was large, and Jane Ann took in boarders to earn money. Jane Ann Mills (lf.) watching the Sully children. 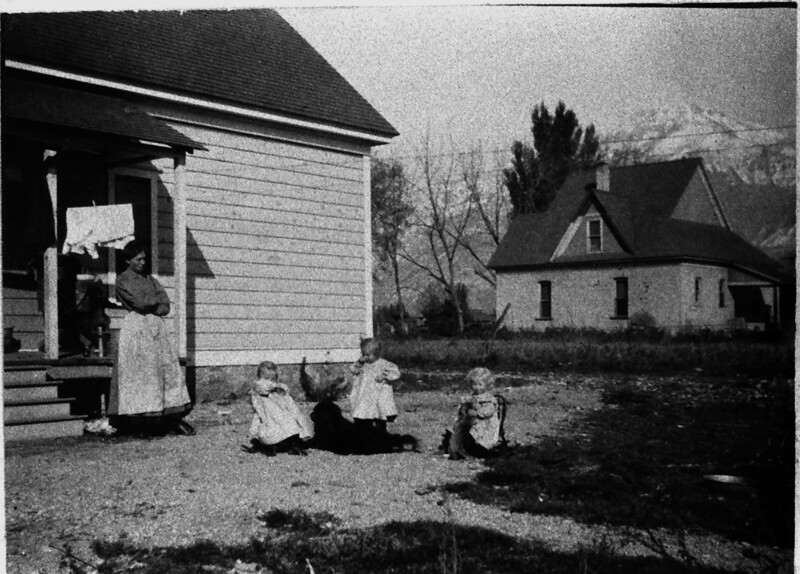 After the rent was raised on the Bingham Farm, she rented and lived in the house on the right at 141 2nd St.; photo courtesy Myrtle Sullly Gamble. In 1909 Thomas Mills and his family, his mother and his unmarried siblings left for Black Pine, Idaho, to homestead, leaving his married sister, Jesse Mills Stone, behind. Before he left, Thomas took out every other 2×6 or “stringer” in the barn and hauled them up to Idaho. Thomas and his brother felt it was unfair to build a new barn and subsequently have the rent raised, having to move out and leave the new barn without any compensation for materials and labor. Their taking the stringers out of the barn made Mrs. Shea angry and had consequences in 1913 when she sold the farm (scroll down to read more). Sarah Stone Brown and children. In 1911 Sarah Stone rented the Mills barn from the Shea family to use for a laundry. Sarah Stone (1872-1963) grew up across the street from the barn on the Stone Farm. By 1909 she was married and living at 297 West 2nd Street. Following are three descriptions of Sarah. – Sarah was a great businesswoman and would balance her daily ledger with utmost care and accuracy. – She was very intelligent and was not happy staying home and caring for house and family; she had to do something additional, like run a laundry. – Sarah sat straight in her old car. When she said something, she meant business. After a divorce, Sarah worked at Troy Steam Laundry at 135 25th Street, Ogden, Utah. 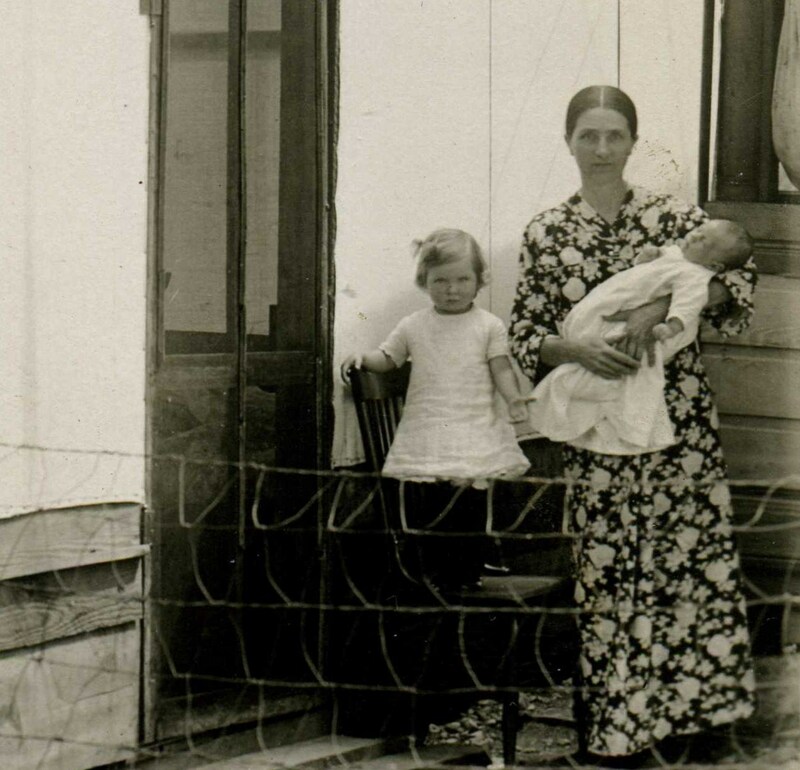 From 1911-1914 Sarah established her own laundry on West 2nd Street in the Mills barn. Walter W. Crowther worked in the laundry for awhile; Walter and Sarah were acquainted since childhood as their parents were dear friends. Later Sarah and Walter were married. In 1913 Sarah’s brothers, Chauncey and John Stone, bought the Bingham Farm including the laundry, granary and cabin. Concerning that sale, Mrs. Shea would only talk to and deal with Chauncey because John was married to a Mills, and she was still mad at the Mills family for taking the stringers out of the barn and hauling them to Idaho. After Sarah closed the Laundry in 1914, Chauncey and John turned it into a blacksmith shop and hay barn. In the 1920s and 1930s the Laundry was known as Stone’s Blacksmith Shop. In addition to John and Chauncey, all the neighbors used the blacksmith shop. Everyone shared tools; nothing was locked up. Farm machinery, tools, and cars were repaired here. In the winter when there wasn’t much farm work to do, the neighboring men gathered at the Blacksmith Shop to talk and work there; it became their gathering place. Blacksmith shop and hay barn; photo courtesy Tug Anderson, c. 1930. In 1940 Clyde and Macel Stone Montgomery moved into the old Bingham cabin and lived there for about thirteen years. They were the last of many families to call the beloved cabin “home”. Macel was a daughter of John Stone. Clyde used the blacksmith shop for a cow barn and later made additions on the north and south sides. It came to be known as the Montgomery Barn, but Macel still thought the use of the barn as a laundry was unique, and she continued to call it “the Laundry”. 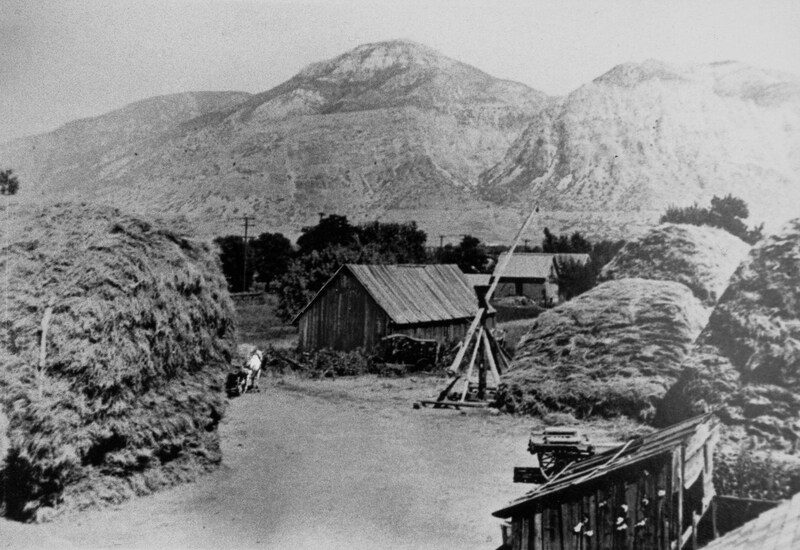 During World War ll some of the prisoners from the Utah General Depot worked on the farm under guard. They often sat on the steps of the Bingham granary to eat their lunch while gazing on the barn. One night some prisoners escaped from the Depot prison camp. Around midnight some of the Montgomery children were still up playing cards, and they saw headlights by the barn. A car zoomed around the barn and back out on 2nd Street and drove away fast. 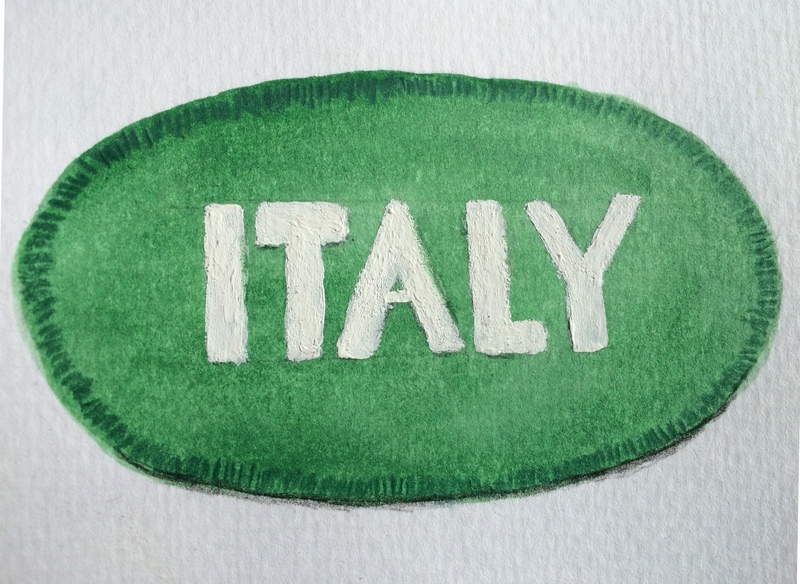 The next morning Clyde went into the barn and found a partial package of cigarettes, matches and a green arm patch that said “Italy”. Then he heard about the Italian prisoners that escaped making him think that the escapees hid in the barn the night before until someone came to pick them up. Painted image of the patch found in the barn; painting by Donna Montgomery Hill. 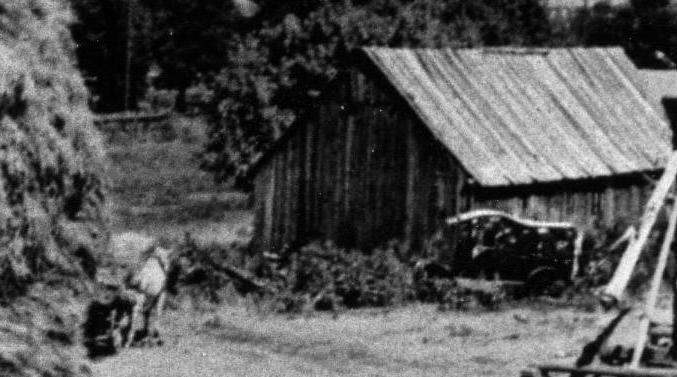 In about 1950 Clyde moved an old garage to the north side of the barn for storage. In 1959 Clyde and a neighbor, Leon Reno, replaced the barn roof and raised it higher. 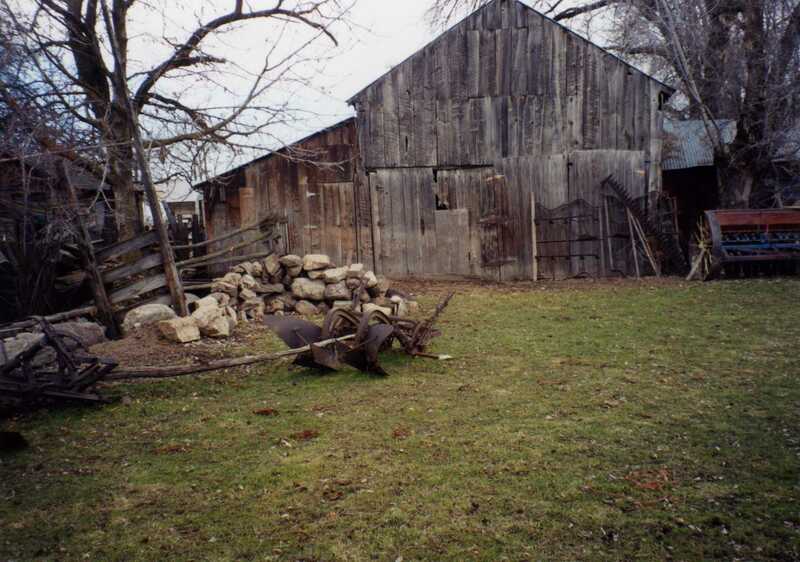 Montgomery Barn: Wing on the left made for cow shed; garage added on right for storage; photo 2001. The lean-to addition on the south side of the barn was made in about 1965 for a cow- shed. 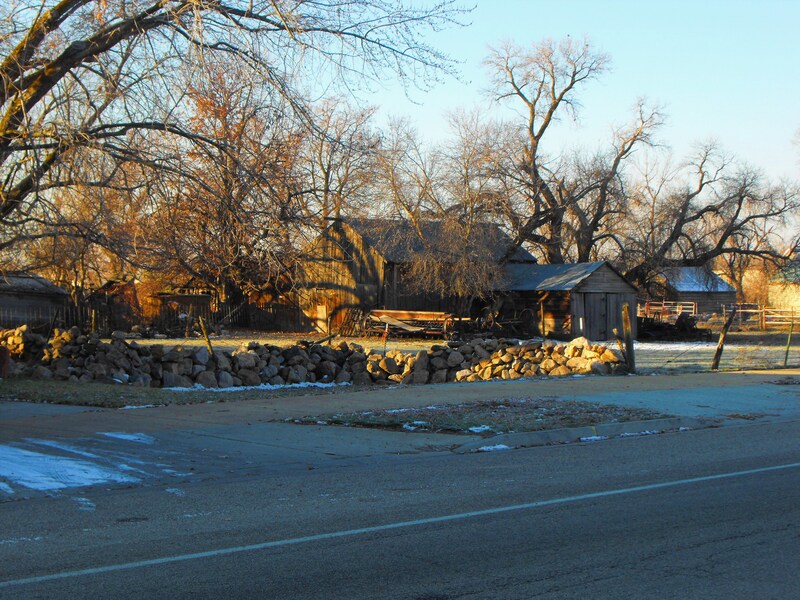 The barn still stands about 200 feet south of the Bingham Fort Monument on West 2nd Street and is easily viewed from the sidewalk or roadway. Today most people call it the Montgomery Barn, but to some old timers, it will always be called “the Laundry”. Abstract: Patrick Shay of Eureka, Utah, purchased the farm from the Bingham family on May 16, 1886, for $3,500. Interview Chauncey Stone by Macel StoneMontgomery, March 27, 1977. Inga Mills, Life of Jane Ann Paddon Mills, c. 1955; Life of Andrew Mills, Inga Mills, c. 1955; interview with Chauncey Stone by Macel Stone Montgomery, November 28, 1965. Editor Milton R. Hunter, Beneath Ben Lomond’s Peak, 1944, Quality Press, Salt Lake City, Utah, p.313. Interview Harvey Stone by Macel Stone Montgomery, March 24, 1977. Interview Chauncey Stone by Macel Stone Montgomery, March 27, 1977. Donna Montgomery Hill, Memories, manuscript, 2010, p. 1.